A field coil is an electromagnetic device used to generate a magnetic field, typically as part of a rotating electrical machine such as a motor or generator. Magnet wire is an insulated copper or aluminium electrical conductor, used in electromagnetic equipment such as motors and transformers and sensors. The wire is wound in coils, which generate an electromagnetic field when energised. Usually, a copper terminal plated with tin, nickel or silver is attached to the free ends of the wire. This joint is a typical application for the Amada Miyachi range of resistance welders and more recently laser systems. For heavier gauge applications on turbine generators, for example, multiple windings are collected together to make a range of single connections. These are traditionally formed into a lug connector after stripping away the insulation. 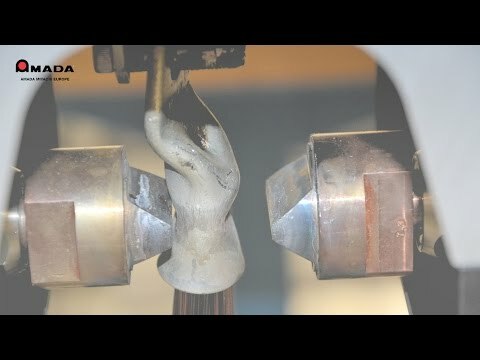 Amada Miyachi’s “Hot Crimp” system is the preferred solution to this application, as it removes the need to strip the insulated wires prior to making the connection by using high current to generate heat within each lug. This heat breaks down the insulation to form a sound electrical joint without the need to strip the magnet wire insulation but also has the added benefit of reducing stresses, which are generally associated with the cold crimping method.